Year after year, I tell myself that I'm going to decorate for Easter. 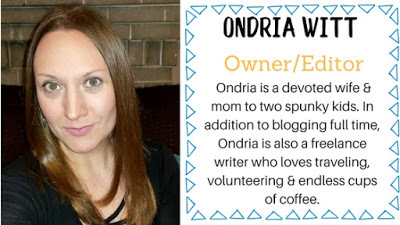 I used to love to decorate for all of the holidays through the year, and then I became a mom, and found that my time was somehow shorter, and I couldn't get all of those things that I loved doing done. I still love decorating, but have to be a bit more clever about it these days. I need quick, easy, and budget-friendly decor. One of my go-to stores for decor is actually the Dollar Tree! If I can't find what I'm looking for, I can usually find the supplies to make it myself. With the rise in popularity of farmhouse decor and rustic designs, springtime is the perfect time to make use of vintage pieces. If you have a local antique store, browse for some wonderful deals. Decorating with white accents makes everything look bright. Adding in pops of color will make any display come to life. Simple touches of spring or Easter, like eggs, birds, and bunnies can hint at the season or holiday without being overly cute or garish. 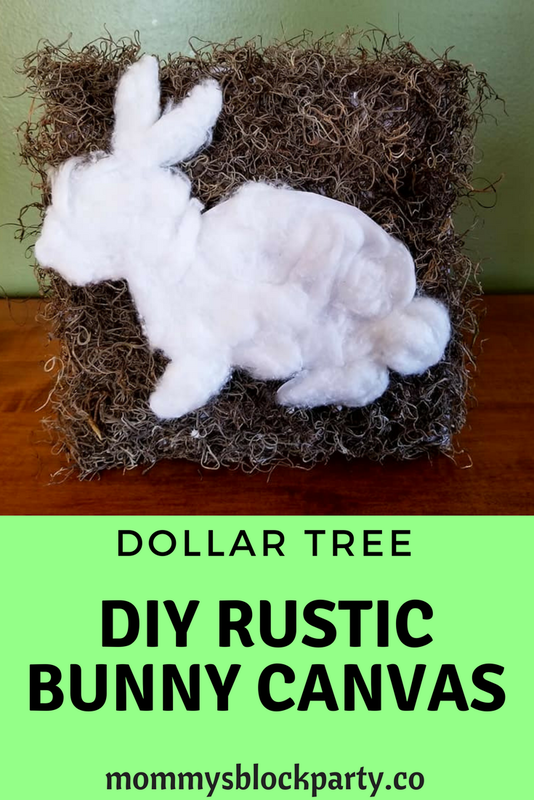 Everything you need to make this sweet bunny canvas can be found at the Dollar Tree! 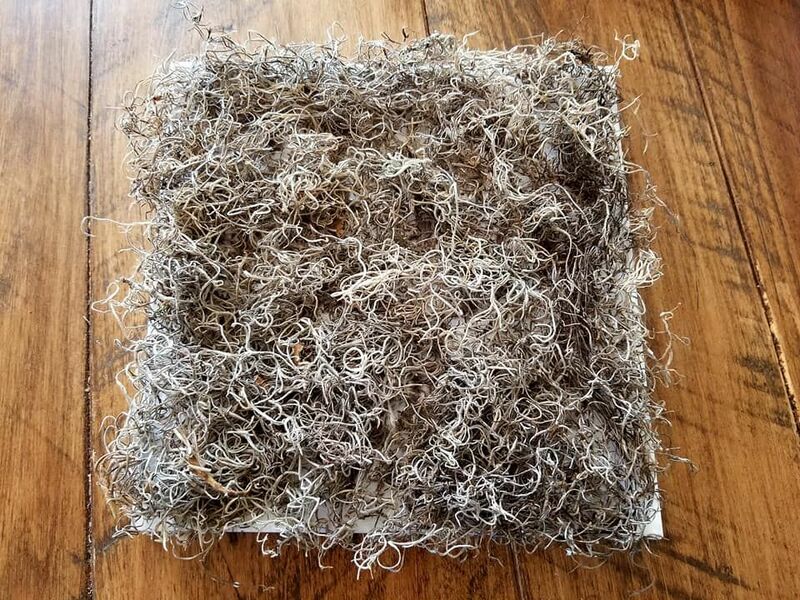 This season, my decorating eye is draw to white, green, and natural fibers- twine, Spanish moss, burlap, etc. When I see seasonal decor in retail stores, I often pass it by, remembering that I have kids to feed. What might cost $15.00 - $20.00 in the home decor section of one of my favorite stores can easily be made for under $5.00 with materials that can be purchased at Dollar Tree. Plus, this project is quick & easy. It takes less than 10 minutes to make, and kids can help with this, or if they're old enough, they can make their own. I picked up the Spanish Moss & a Canvas at my local Dollar Tree. The canvas was printed (and cute! ), but I just needed a canvas to cover for the project, and this was a much cheaper option than buying a thicker blank canvas from a craft or hobby store. I already had the cotton balls at home, but you can also find cotton balls at Dollar Tree. As for an adhesive, I thought about using a glue gun, but went with the Craft Bond, instead- for quicker, easier coverage. The Bunny Template was simply a printable coloring page, which I cut out and trimmed down a bit to fit the canvas. Covering the canvas gives you a natural backround. Start by covering the front of the canvas print with the moss. I spread a pretty even layer of Craft Bond over the canvas, and then gently pressed the moss to it. Be warned- the moss is messy! After I had the majority of the canvas covered, I went back and filled in the bare spots. Next, make your bunny fluffy! 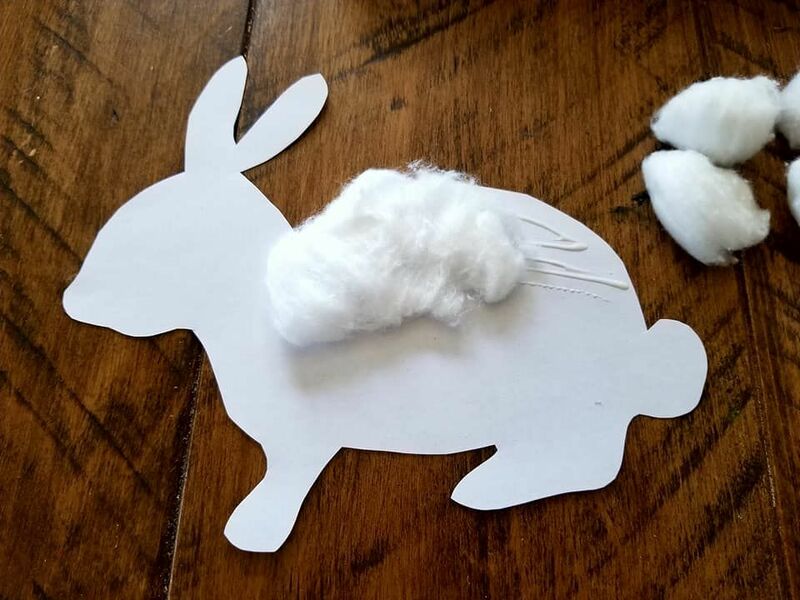 Print out the free bunny template, and then glue on the cotton balls. I chose to gently pull the cotton balls to give my bunny a fluffy look. Glue the bunny template to the moss and let dry. 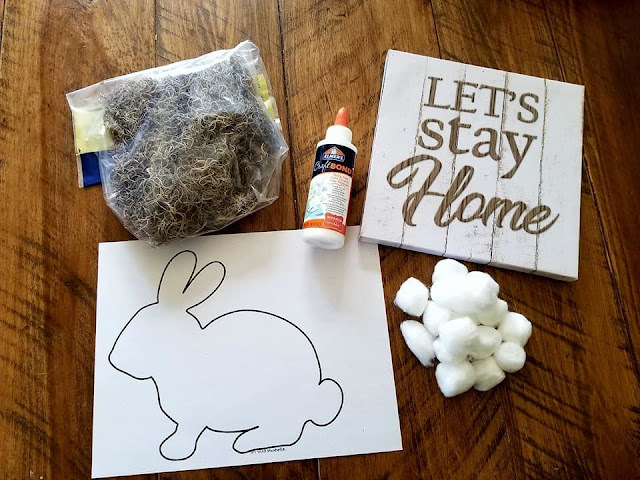 After the bunny is covered in cotton, carefully use the craft bond to glue the bunny to the canvas. Let it dry completely. You can easily staple twine, ribbon, or rope to the top (back) of the canvas, if you want to add a hanging element to the project. Again, Dollar Tree has decorative ribbon in their craft aisle, or decorative rope. 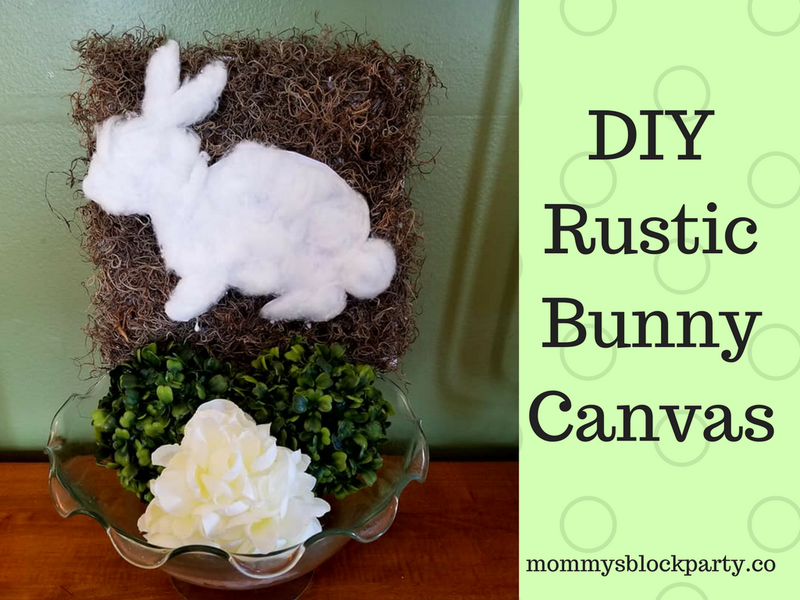 Add your bunny canvas to your decor! 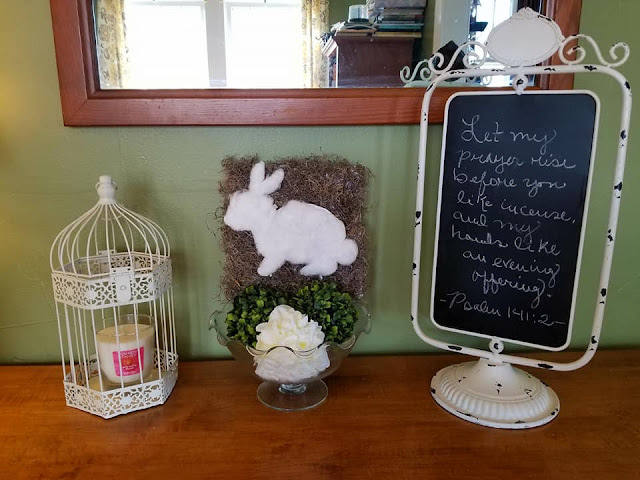 I'm still working on my Easter'scape', but I thought my Bunny Canvas would look super cute with some of the spring accents I have recently purchased or received, like my $5.00 birdcage find at my local Rite Aid, the Floral Balls from JCPenny, and the Rustic Chalkboard from Cracker Barrel, and of course, a yummy-scented candle from Yankee Candle. 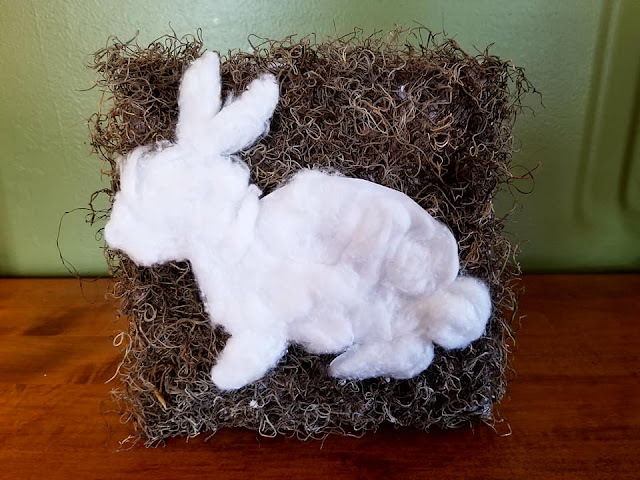 This little bunny would look sweet on a mantle, a shelf, hung on the wall, displayed on your front porch, or anywhere else you might choose to display it. Like this craft idea? You can make it this weekend! It's not only perfect for Easter, it's perfect to use all season long! Be sure to share this post, or Pin it for later! Did you make this project? I'd love to see how it turned out! Be sure to share your pics on social media & tag @mommysblockparty on Facebook / @mommysblckparty on Twitter & IG! That is a super cute idea for Easter! I love the Dollar Tree though it is more like the $50 Tree before I leave. I hear ya! It's easy to spend a lot of money in there!